Formerly in the parish of St Andrew, there were provisional arrangements for services in the area from 1953. 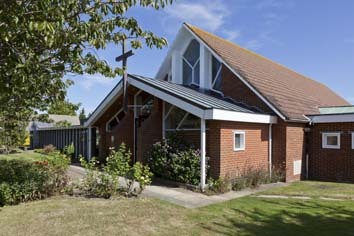 In 1956-58 (TCA 3 p112) H H Ford designed a low, brick church with a steep roof, of which the main timbers are laminated and rise from the ground. Most windows are small and rectangular and the interior is all white with simply a shallow recess for the altar. There is also an attached hall on the south side. 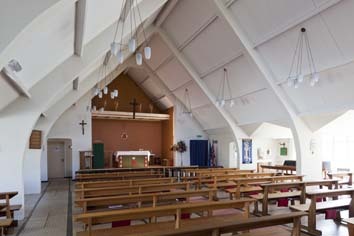 The church was extended by J D Clarke and Partners (F Ford), with south (1977) and north (1986) aisles. The same firm added the lower western narthex in 1994 (BE(E) p366). A separate parish was constituted in 1969. 1. 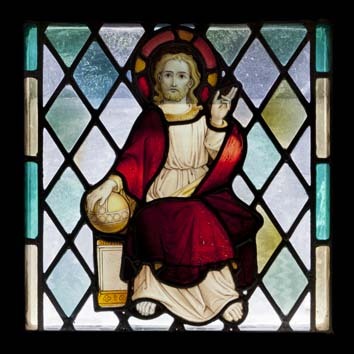 Nine windows by A E Buss (a one-time member of the congregation) (JSG 23 p99), 1980-85, set in the small rectangular windows of the south chapel and north aisle. 2. (Narthex) The panels of glass in the narthex, set in larger plain glass windows, came in part at least from the bombed church of St Anne, Upperton Gardens (NW). The figures of St Anne and St Elizabeth are said to come from the Hospital of St Mary in the Old town and to be by M Douglas-Thompson, but this is open to doubt on stylistic grounds. Otherwise, their authorship is unknown. My thanks to Nick Wiseman (NW) for the photographs and information about the glass in the narthex.